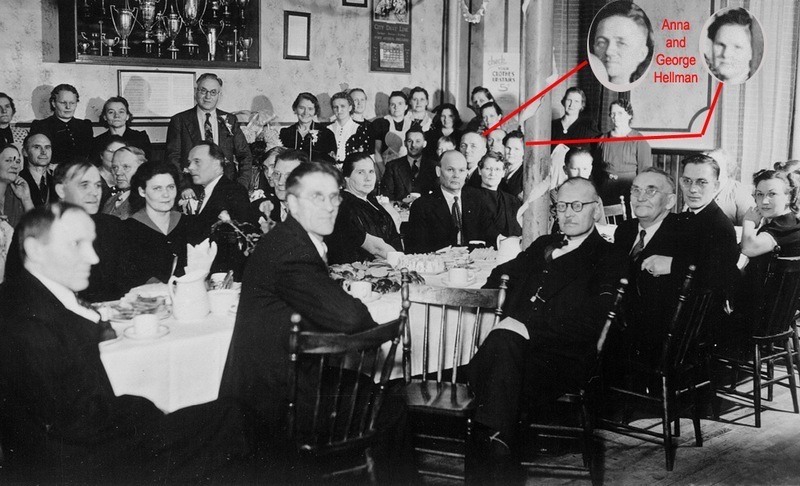 Hi -- I've been looking at the photos on this webpage (http://www.finlandiaclub100.com/labourtemphist.html ) and can see my grandparents in the one on the bottom left. George Hellman managed the Hoito for 24 years from 1934 to 1957. He was a card carrying IWW member until his death in 1972. .... If that photo was taken in 1957, it's possible that this was Grandpa's send-off dinner. He was given an engraved gold watch honoring his long years of service when he left the Hoito. My grandparents lived for most of those years in the little house up the hill on the same side of Bay Street as the Hoito at the corner of Bay and Banning. My brother and I used to scramble up the hill to the park. I remember seeing and hearing a horse drawn milk cart go by on Banning from the basement window (which is where my brother and I slept when the family visited). My Dad grew up in that house. I'd be interested in hearing from anyone who remembers my grandparents and can tell me some of the old stories now that they and my Dad are gone. BTW - there are some union documents in Finnish in the Canadian National Archives - making up what they call the George Hellman collection. There is no personal information given about him there and no indication of how the documents got into that collection. I have just completed a video project about Grandpa and his union days for my M.Sc. program; however, because I have not secured all necessary permissions for images that did not come from the family connection, I have not made it public yet. But if there a few people who'd like to take a look and will not share the web address, I can make the link available.